Table Size: 30″x 60″ (HxW) In Inches (without Glass 3 piece folding unit) ; Chair Size: 20″ inches Height Approx. 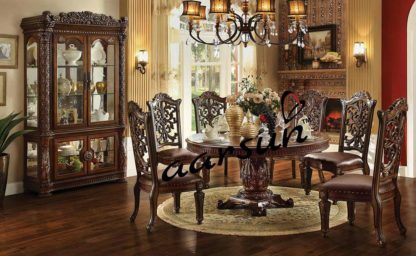 Aarsun Woods offers to you handcrafted antique stylish wooden dining set made from premium quality teak wood by experienced craftsman. The elegant styling of this dining table is sure to make a beautiful focal point in your dining room. The double pedestal base and table edges are both enriched with amazing carved detail and flowing curves. 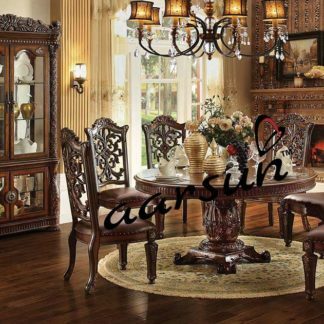 The wooden dining set have floral carving with natural finish. This dining set features soft lines and crafted shapes which make it functional and stylish.